Tom E. Nightingale, PhD, is a Postdoctoral Research Fellow in the Faculty of Medicine, Division of Physical Medicine and Rehabilitation at The University of British Columbia in the laboratory of Dr. Andrei V. Krassioukov. After receiving his Bachelor’s degree in Sports and Exercise Science from the University of Bath in 2010, Nightingale earned his doctorate in Exercise Physiology from the same academic institution in 2016. 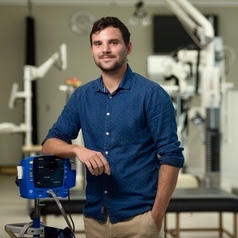 He is currently supported by a joint Michael Smith Foundation for Health Research (MSFHR)/International Collaboration On Repair Discoveries (ICORD) Trainee Award, titled: cerebrovascular burden and cognitive impairment after spinal cord injury). Currently he studies the effect of aberrant blood pressure fluctuations on cerebrovascular health and cognitive function in humans with high-thoracic/cervical spinal cord injury, as well as investigating the impact of exercise on cardiovascular disease risk biomarkers. Other research interests include investigating various neuroprosthetic strategies to modulate autonomic functions following spinal cord injury.